The new Vichy Bi-White Reveal Night Double Corrective Whitening Cream is targeted at those who want something to help with pigmentation. Here’s where I raise both hands. Me! Me! I have a pigmentation problem that needs addressing! 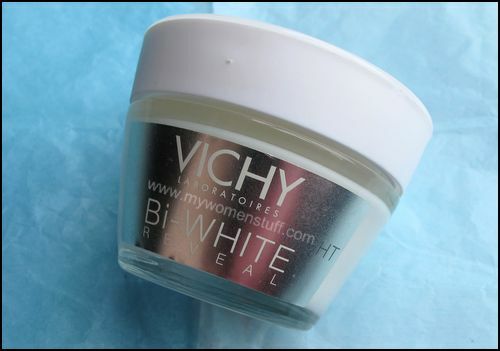 The Vichy Bi-White range of products has been around for a while, but this night cream is new. I’d run out of whitening skincare so it was a good time to try out this night cream. 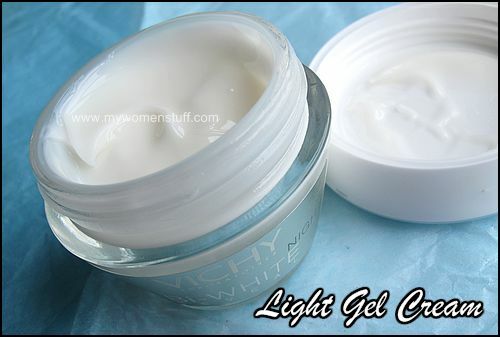 The texture of the Vichy Bi-White Night Cream is light. I’m obsessed with light textured creams lately. They suit more skin types than oil based creams. Because it is so light, it sinks right into my skin so I have to use the 5-dot method to apply the cream as opposed to my usual method for applying moisturizer. I have one gripe. Upon opening the tub, your nose is hit with the scent. Not floral, not unpleasant, but a pretty strong sharp scent nonetheless. Do make sure you take a healthy sniff at the counter before you run out and buy it. Another gripe is with the shape of the tub. It tapers down so its top heavy and its glass. It doesn’t topple over – the designers were cleverer than that! But it makes it hard to store when you have other bottles jostling for space. The biggest question you’re asking I know, is – Does it reveal lighter whiter skin? You know, it just might. I’d been using this for about 1 month only at night since this is a night cream. I tried peering at my pigmentation spots to see if they were any lighter but it was imperceptible so I gave up looking but continued using it. However, about 3 weeks into using it, my Mum whom I had not seen in that time commented on the fact that my freckles and pigmentation was looking lighter and my skin was looking a little brighter. That got me running to peer in the mirror but I couldn’t really notice it. Its hard to notice small changes when you look at yourself everyday as I’m sure many will agree. So with that, I’d hazard a guess that the Vichy Bi-White Reveal Night Cream does work to a degree. It will not turn you into Snow White and neither will it lighten your skin to the point of transclucency nor will it get rid of any pigmentation spots you presently have. However, it will place it under control and perhaps make it look slightly less obvious. You’d need more than 3 weeks to see a result which I prefer – anything that whitens or lightens too quickly scares me. One more gripe: My skin felt a little dry when using this cream. The cream contains thermal spa water as do all Vichy products. But I personally felt that this night cream did not quite keep my skin as hydrated as it should. Its not drying me out, but neither did it make my skin feel plump and supple. Do note that I have slightly dry skin on my cheeks so that might be the reason. Used only at night, this 50ml tub can last ages! It retails at all Vichy counters for RM99 which I think is a fair price since it does work to a degree. Do also note that when you use whitening/lightening products whether in the day or night, you MUST always use sunscreen in the day. It is not optional. Do you feel you have a pigmentation problem that needs addressing? Have you taken a look at this one or have you tried it? PREVIOUS POST: Celebrate October: Bloop de Paris for the win! Thanks for the review, just spotted some little brown spots on my cheekbones yesterday. Would put this into my list! I’ve been surprised time and again too – its not a brand I pay much attention too. In fact, I use both Paul and Joe Whitening Serum AND Fair and Lovely Anti-Marks Fairness Cream, and the combination works well for me…that and the SK-II Signs cream and SPF 90+! You’re doing good with your regime! We actually have Fair and Lovely here but I’m a little too afraid of their 14 day whitening deal. Which SPF90 sunscreen do you use? i have a bit of pigmentation on the checkbone due to pregnancy. i’m using bio oil. it works on the pimple scar and i can see slight improvement after a few application on the dark spot. Ah I’d read about pregnancy hormones that cause problems like this. I also read its harder to get rid of those. Glad you’ve found something that works. Love the light texture but dislike the scent..
Would I be able to buy this item and get it delivered to New Zealand? I am dying to get it, but I can’t seem to find a website that can sell it to me. Hi Laura, I’m sorry I can’t oblige. I’m not sure if there are ebay or auction sites that will ship to New Zealand. If I come across one I’ll be sure to update my comment here. hi.. i m 33 yrs old. 6 months back i discovered dark spots and a small dark patch on my upper cheeks. have tried using creams prescribed by my dermatologist, but have not helped much. can u suggest any night creams. I want to buy online the vichy bi white reveal deep ……… treatment cream to remove hi pigmentatin. I cannot find the site. Please help. I was wondering if you can help me out on this product although your review was done quite a long while ago. You mentioned about the “scent”? Does it smell like a floral scent gone slightly bad? A while back I bought this on a “buy 1, free 1” promo but had only just recently used it. The scent is pretty strong and not really in a very nice way. I was wondering if there is something wrong with the one I bought although it still has quite a while to go before its expiry date. Hi Vivi I’m afraid I don’t remember how this smells anymore. I am using Bi-white reveal Night. Can you suggest me which cleanser should I use with this product in night or only the face wash is enough? One thing I want to mention, Since i use this product some time some small pimples come on my face. If you feel the product breaks you out you may want to stop using and see if it gets better. As for face cleanser, I’m not sure I detest and your question but anywhere is no specific face wash/cleanser to be paired with this.